GENEO - Excellent energy efficiency, design, comfort, safety and durability. 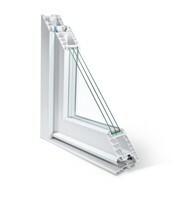 In terms of energo-effectiveness, GENEO is the best window - door profile system currently available for 86 mm construction width. for sound insulation class 5 (including optimal thermal insulation). Without steel reinforcement, resistance class 2 (including optimal thermal insulation). Best thermal insulation among competition, without sacrificing design, comfort, longevity.